Happy Tuesday my loves!! Hope you guys are off to a productive week! This past weekend, we finally had a break from all the rain and I couldn’t wait to break out my florals just in time for some spring weather! 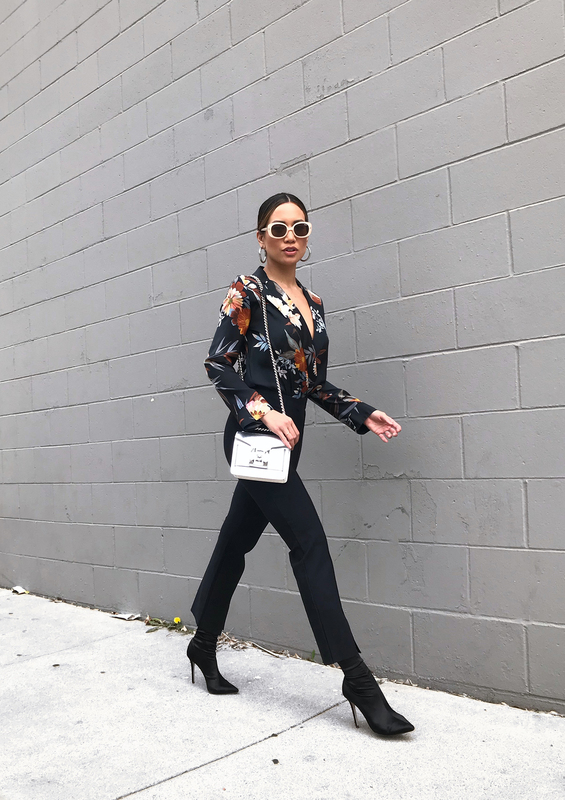 I love this floral bodysuit by Zara because it’s really lightweight and airy, perfect for a casual spring day, but can also be transitioned into a dressier outfit for nighttime. I paired this blouse with my new “cigarette pants” from my fave activewear brand, Carbon38! Hard to believe..but these cigarette pants are actually made from a four-way stretch fabric that is moisture repellant and antimicrobial..so yes you can workout in these! I haven’t tried it yet, but for now these ultra-comfy trousers are my lil secret to staying comfy, yet looking put-together at the same time! Love that they still look chic and sophisticated enough to wear in a professional setting. 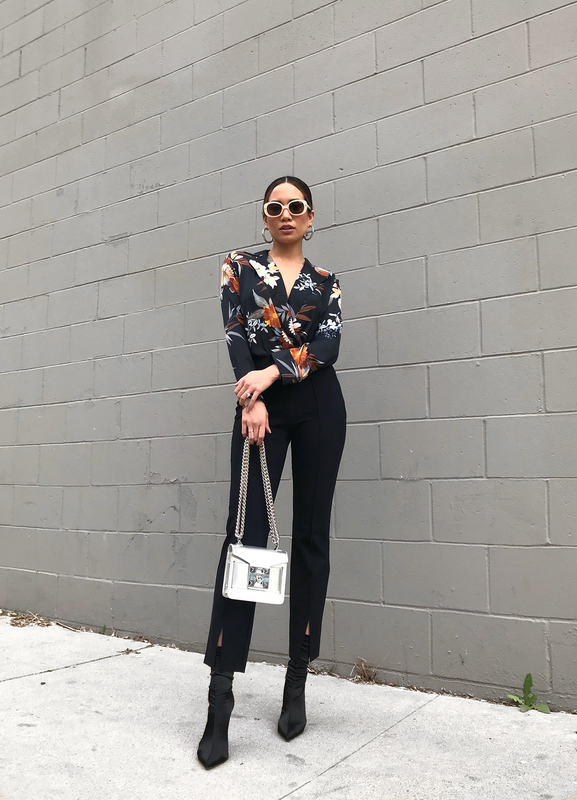 I finished off this look with my new SALAR chain crossbody bag in metallic silver, micro sunnies by Quay x Tony Bianco and silver hoops by Baublebar. Florals in black look so chic! This is such a sleek and elegant take on a spring floral Jessi! I love your new Salar bag too, metallic bags are always so good to add that extra something to elevate any outfit I think! It would look so fab on you too, Ewa!! Enjoy your week! Jessy no puedes estar más guapa y vaya cuerpazo. Por cierto estoy obsesionada con tu canción de Do it, la tengo puestra todo el día. You look beautiful as always, girl! How cool that you can actually work out in those pants! So good for people who like to go to the gym on their lunch break while at work! Thanks for sharing and I hope you’re having a great day! right?!! so unique and chic at the same time! I’m obsessed!! Such a chic look Jess! I love the slits of the pants. Thanks Lisa!! Def try them out, they’re such great pants to wear out! I love the dark floral and the whole style is just stunning! That silver bag is really cute! Yessssss, really loving the silver touches to a simpler dark outfit! It’s such a great complement to any outfit!! this dress is so gorgeous and i love the dark floral print! It’s rainy here and a bit cool, so I’m hoping good weather. Loving the top! So much looove for this floral top my dear! 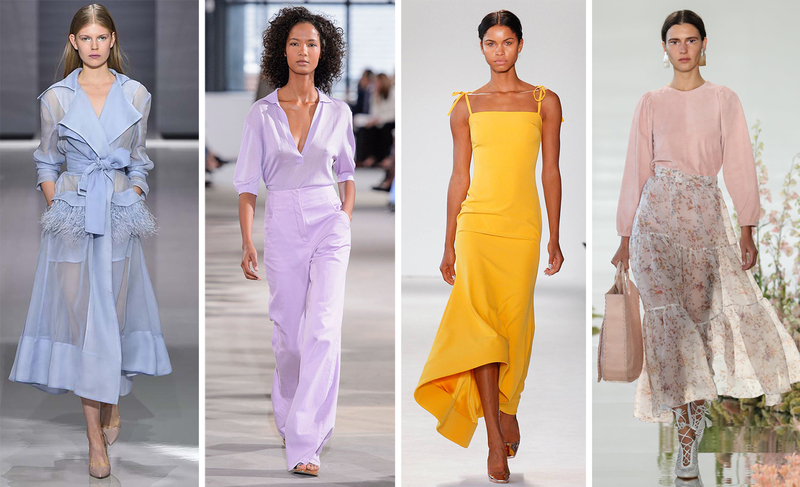 The perfect spring look! Oooh that metallic adds so much glamour to this outfit! Love the chic and minimal outfit look you have created, you nail each and every style! 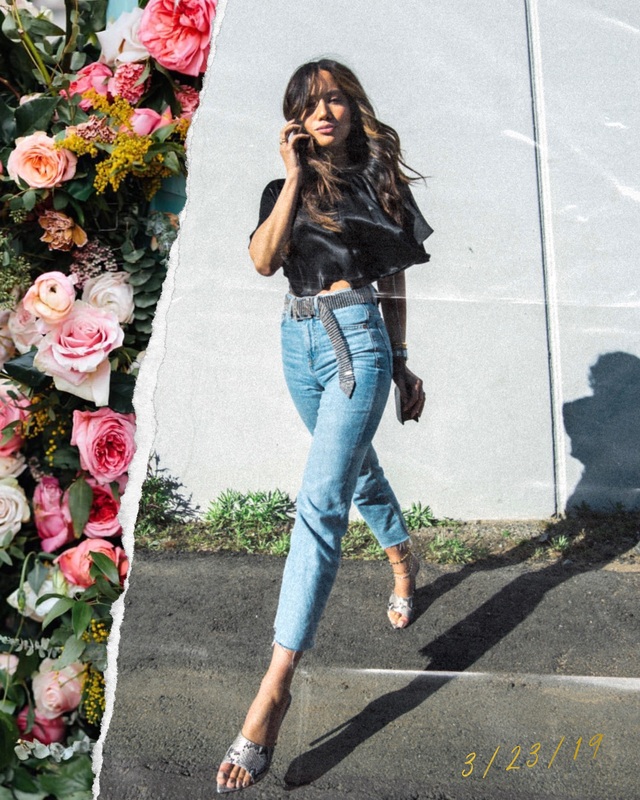 What a great floral top and chic everyday look! You look amazing!